You can sort cards in iRise Manager by ascending or descending order using the custom schema attributes of the iRise project you want to sort on. To sort requirements in Manager, begin by typing in an attribute to the Filter Bar located at the top of the Manager interface. Once the list of options populates, select the Sort By option to sort your requirements. You can sort by more than one attribute by typing in another to the Filter Bar. 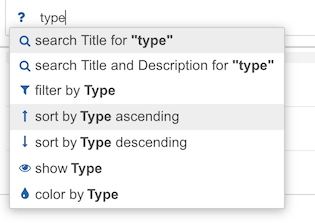 After selecting your sort criteria, you can toggle between ascending or descending order by clicking on the arrow icon directly to the right of each attribute in the sort criteria on the Filter Bar. You can also adjust the sort order by clicking the drop down arrow located on the far right side of the sort criteria. You can also drag and drop the order of the attributes in the drop down menu to re-order them. This will affect how they are sorted. The sort order defined in iRise Manager does not affect how requirements are displayed in Custom Reports, the Player Requirements Panel or the Editor Requirements Panel.